22 barista magazine VERTICAL INTEGRATION: WORKING WITH AND OWNING FARMS AS THE DEMAND FOR SPECIALTY COFFEE grows, controlling more areas of the supply chain is one way that coffee companies can attempt to increase quality. How better to control those variables than by managing the coffee farm through ownership? It's far from that simple, however. With the prospect of vertical integration, there are many areas that could benefit from direct feedback through observation. For instance, there are advances that could be made to expand the knowledge of best practices for green coffee. Currently, farmers have access to surprisingly little scientific data concerning these practices. However, coffee farmers within a more direct model may benefit from increased feedback from companies that oversee how small changes at origin influence the cup. There is also the potential to greatly improve the sustainability of spe- cialty coffee as more companies understand the effort that goes into each part. However, doing so successfully will require that these companies navigate the challenges presented by naivety and money. "Growing coffee is really, really hard," says Edwin Martinez of Onyx Coffee in an email. 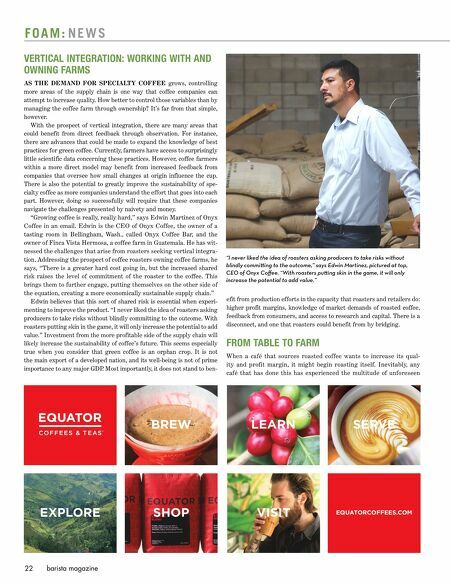 Edwin is the CEO of Onyx Coffee, the owner of a tasting room in Bellingham, Wash., called Onyx Coffee Bar, and the owner of Finca Vista Hermosa, a coffee farm in Guatemala. He has wit- nessed the challenges that arise from roasters seeking vertical integra- tion. Addressing the prospect of coffee roasters owning coffee farms, he says, "There is a greater hard cost going in, but the increased shared risk raises the level of commitment of the roaster to the coffee. This brings them to further engage, putting themselves on the other side of the equation, creating a more economically sustainable supply chain." Edwin believes that this sort of shared risk is essential when experi- menting to improve the product. "I never liked the idea of roasters asking producers to take risks without blindly committing to the outcome. With roasters putting skin in the game, it will only increase the potential to add value." Investment from the more profitable side of the supply chain will likely increase the sustainability of coffee's future. This seems especially true when you consider that green coffee is an orphan crop. It is not the main export of a developed nation, and its well-being is not of prime importance to any major GDP. 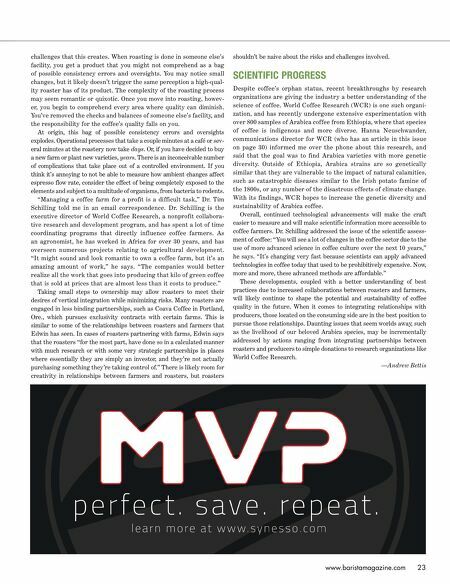 Most importantly, it does not stand to ben- efit from production efforts in the capacity that roasters and retailers do: higher profit margins, knowledge of market demands of roasted coffee, feedback from consumers, and access to research and capital. There is a disconnect, and one that roasters could benefit from by bridging. FROM TABLE TO FARM When a café that sources roasted coffee wants to increase its qual- ity and profit margin, it might begin roasting itself. Inevitably, any café that has done this has experienced the multitude of unforeseen F O A M : N E W S "I never liked the idea of roasters asking producers to take risks without blindly commi ing to the outcome," says Edwin Martinez, pictured at top, CEO of Onyx Coff ee. "With roasters pu ing skin in the game, it will only increase the potential to add value."